The village of Bashley has a long and interesting history of settlement and farming. The name Bashley derives from Old English. 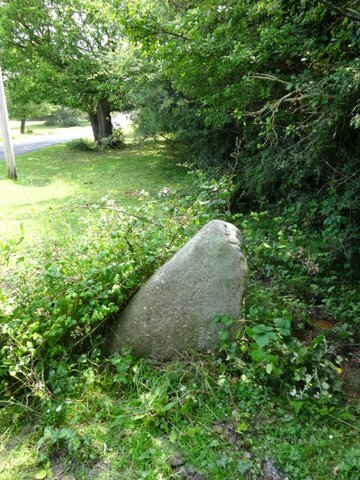 It was originally ‘Baylokesleya’ or ‘Bageslucesleia’ which is understood to mean Bagloc’s woodland clearing. Evidence of early Neolithic man can be found near to the Rising Sun pub in the form of a Sarcen stone used as a wayside marker. Sarcen stone is the same material that Stonehenge and Avebury rings was made with. Bashley has the earliest documented reference anywhere in the whole of the parish. In 1053 the Christchurch Priory Cartulary records a “gift by King Edward and neighbouring peoples, to his faithful thegn Lutrise of half a mansa at a place in English called Bageslucesleia with fields, pastures, meadows and woods. He may bequeath it to whomever he pleases, and hold it free from all service except bridge and fortress building and military service”. The 1068 Domesday book records that Bashley was held by a priest of Christchurch called Alsi. 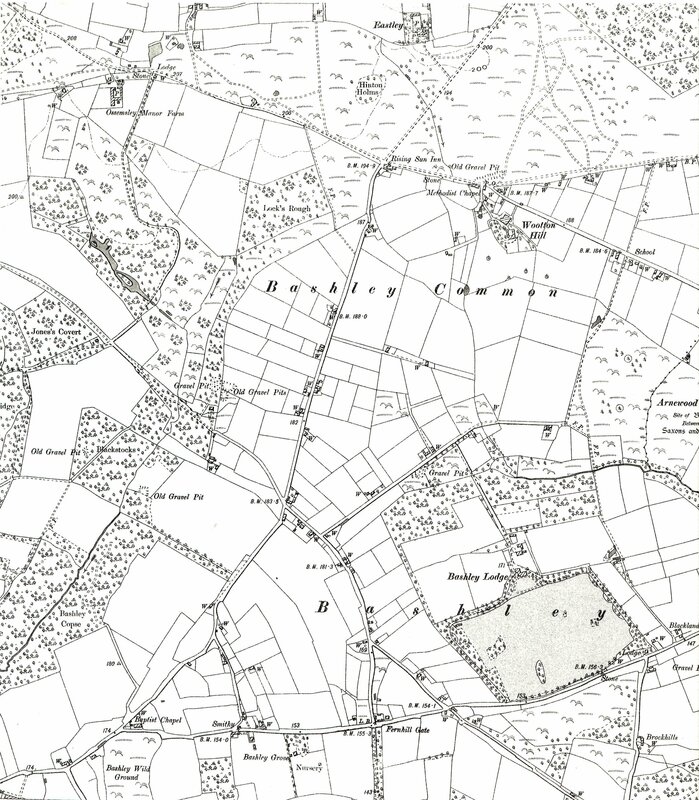 The area of Bashley is described as being of 3 virgates (about 90 acres) it had land for one plough. It was held in lordship with 2 slaves, a villager and a smallholder. The value of the area was 20 shillings. Christchurch priory held ownership of part of Bashley until the dissolution of the monasteries. There is a record in 1262 of William Boscher holding land at Bashley. This later passed to his son Robert. 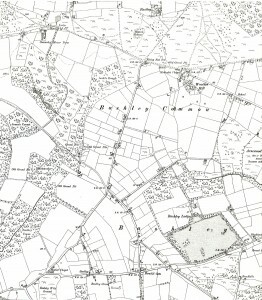 Bashley Common was enclosed, in 1817, by agreement rather than by act of parliament. The Tithe map shows James Brett as being a significant landowner of the time. 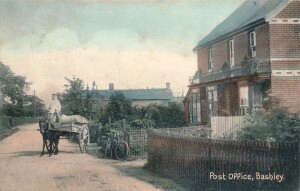 Bashley Cross Road and Sway Road. Opposite Ferndene Farm Shop is a cottage once owned by the Loader Family. 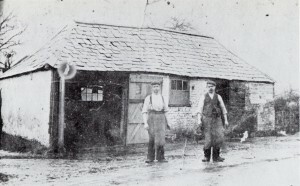 The building now used as a garage was the Smithy. In this image taken in about 1910 you can see Mr Charles Loader and his apprentice a Mr Haskell. The Loader family still live and work in Bashley. They run a successful garage and car repair business opposite the Post Office on Bashley Common Road. 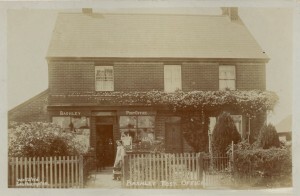 Bashley Post Office and village store has been in business for well over 110 years. The first post master, Albert James, was appointed in 1902. He was also a draper, grocer, mealman, tobacconist and sold boots and shoes. Carol and Den who are the current owners provide a similarly wide range of goods and services in their new shop which is built next door. These images of the post office are taken in about 1910. 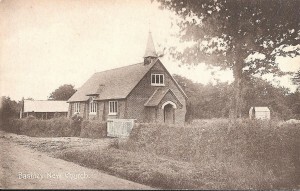 The church of St John The Baptist was built in 1910 in what was called Church Lane but is now known as St John’s Road. The church cost a very reasonable £300 to build in brick. Services are still held there and are well attended. In the vestry is an amazing hand drawn memorial to the Bashley villagers who served in the Great War. It records that exactly 100 villagers joined the armed forces and served King and Country between 1914 and 1919. If 100 men of the village were away, the workload of running farms and businesses and keeping the village life going must have fallen on the shoulders of the women and young boys. Bashley has a strong tradition of horticulture. In the 1870 Miss A. Bateson set up a plant nursery there. She was Britain’s first female professional nursery owner. In 1928 on her death Mr Lane took over the business. Horticulture is still represented in the village by Bashley Plant Centre and Redcliffe Garden centre. Current and future events in the village and details of the local businesses can be found on line as well as advertised in local papers and magazines. 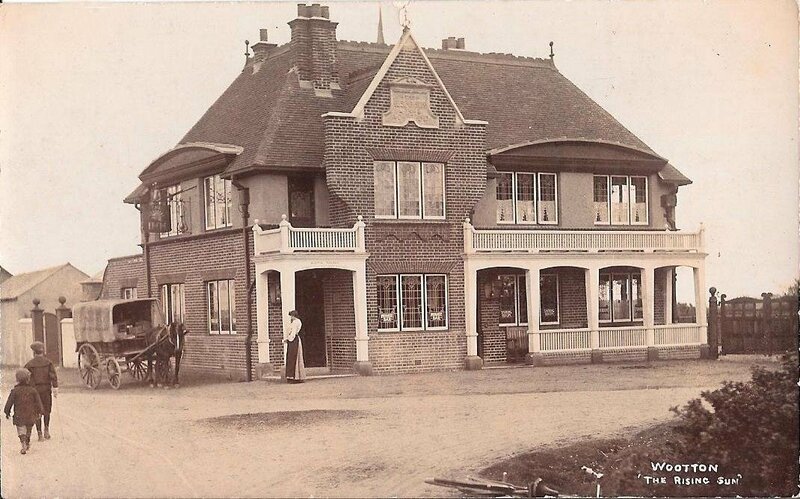 With its long history and current wide range of shops and services, a cricket team, a football club as well as a thriving social life centred in the village hall Bashley is well worth a visit.